Mark Podwal is an artist, author and physician. He's also my friend of many years. And he is the author and illustrator of many books for children, including the Jewish Book Award winner, The Angel's Mistake, stories and paintings about the endearing fools from the town of Chelm of Jewish folklore. In his A Passover Haggadah he joined the commentary of his friend Elie Wiesel with more than 50 exquisite drawings. Especially joyous is his A Sweet Year: A Taste of the Jewish holidays. His beautiful works of art, mostly on themes of Jewish history, legend, and legacy, are represented in the collections of the Metropolitan Museum of Art, the Victoria and Albert Museum, the Carnegie Museum of Art, Fogg Art Museum, the Jewish Museum in Prague, and the Library of Congress. 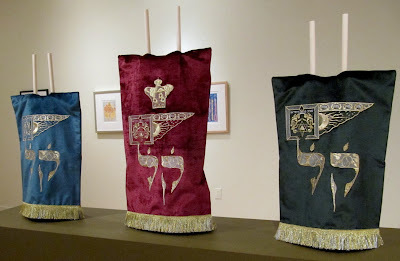 Now Podwal has moved from illustration to history, in designing textiles, including a Torah curtain, for Prague's Altneuschul (Old-New Synagogue), the world's oldest operating synagogue. He was commissioned to design new textiles for the sanctuary. Embroidered in shimmering gold thread on rich velvet, the textiles reflect the traditions and mythology of the Altneuschul and one of the world's most vibrant Jewish communities. Before they are shipped to Prague for installation they are on exhibition at Yeshiva University Museum's downtown branch at 15 West 16th street. How fitting that the Altneuschul (Old New Shul) should have the creations of Mark Podwal, whose entire body of work represents the marriage of old and new. For the textiles he researched the historical precedents, but created something contemporary. The manufacture of the textiles by Penn and Fletcher was itself a synthesis of tradition and technology.